This month, our featured guest is Charles Glatzer. We want to thank Charles for taking the time to answer our questions, and share some of his story and insights with us! Please visit his site links to see more of his incredible work, and to let him know you enjoyed this interview. :: Please give us a summary of how long you've been in the photography business, and how you got started. My professional photo career began 29 years ago in1983. I was intrigued with the photographic process at an early age. A high school photo course provided the catalyst, shortly thereafter I began working in a camera store. During College (Marine Science) I started working with a carriage trade wedding and portrait studio on the gold coast LI, NY. It is in the studio I learned how to paint with light. A studio is essentially a black hole, whereby subjects or products are illuminated through light quality, quantity, and direction. These three items remain essential to every image I create. In the studio you learn about lighting ratios. Regardless of the subject matter, I see light in ratios, nothing is just lit. The lessons learned in the portrait studio prove invaluable every time I depress the shutter. I was urged by many to join PPA, and in three short years (1996) I earned the coveted Master of Photography Degree, and certification in commercial photography. It was shortly thereafter after a friend of mine (Don Landwherle) graduated from RIT and began working with Pete Turner, one of the premier commercial photographers of our time. When Don left to work on his own, I followed, and began my commercial apprenticeship furthering my education in creative lighting, conceptualization, visual design, and color. Additionally, I have worked in and owned a color lab, producing thousands of color prints. A partner and I started the first online Nature Photo Magazine, a template to which all others now follow. My career has certainly been diverse including, portraits and weddings of notable sports and public figures, advertising campaigns and annual reports, underwater, editorial reportage around the globe, professional sports, catalog and product. I have used 4x5, Hasselblad medium format, Leica rangefinder, 35mm Nikon and Canon film and digital cameras both on land and in UW housings in my photographic endeavors. I have worked with amazing photographers over the years, the tutelage received during those formative years continues to be instrumental in where my career is today. 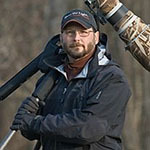 :: I know you've photographed other subjects during your career, but what was it that that caused the change to fulltime wildlife? Was it always the goal? I think ultimately ending up as a wildlife photographer and photo educator was a natural progression for me, but it was never planned. My dad instilled in me a love for all things wild at an early age, camping, canoeing, hunting, fishing, orienteering, birdwatching, I was enthralled with anything we could do outdoors together. Photography was always about the process, rather than the final imagery. I was a knowledge sponge. I know how to use every camera I before it is purchased. I never wanted to do weddings, I just fell into it, and in truth I never liked doing them, but the dollars were at the time very good, and I was good at it! I loved commercial work and the challenges, but the day to day marketing, short deadlines, estimates, and trying to collect invoices from advertising agencies was a full time gig, with limited time depressing the shutter. In the 90's I took up underwater photography, combining my love of the ocean with scuba diving I traveled the globe in search of subjects large and small. Stock photography was at a high, but having additional revenue streams was necessary for the business to prosper. I came to the realization teaching could be profitable, and I started to teach underwater photography on liveaboard dive boats around the world, and became an associate adjunct professor of photography for Long Is. University South Hampton. I found I loved teaching almost as much as shooting. After my daughter was born I decided to turn more towards teaching and my love of the natural world, and the animals therein. I opened Shoot the Light, Inc. in the midninety's and never looked back. I love what I do, and consider myself truly blessed. STL has exceed all of my expectations, but I have never worked harder or longer hours. Moreover, I would not be where I am today without the love and support of my wife and daughters. And, the continued support of my participants. :: Any desires to shoot a wedding or anything of that nature? No! I found it extremely frustrating toward the end. At the time of booking you are a priority and very important, but on the day of the event you would often not have the time or cooperation to produce the full results you knew you were capable of creating. I had to realize I could only produce the best imagery possible within the boundaries given. I felt I had to compromise my integrity for the almighty dollar. And, this was something I was not willing to do. It was time to move on! :: Your portfolio spans about every kind of bird and creature that photographers would strive to shoot…what animals are left that you really would like to shoot, or is there a particular occurrence in the animal kingdom you want to shoot? I love the Arctic and SubArctic Regions and would like to spend more time photographing the creatures that inhabit these amazing environments. The daily struggle for survival, the stark graphic nature of the landscape, the inclement weather few get to witness strikes a cord within me. This is a place truly wild most will never get to experience, except through the eyes of another. :: Have you ever head underwater and shoot some whales or sharks? Photographing underwater was amazing. Every moment I spent below the water surface was filled with sensory overload. Imagine living in a dream. What a rush. I do think about heading back UW often, but the gear is extremely costly to do this competitively, and I am not getting any younger…lol. :: What is the biggest challenge to photographing wildlife? Having the stars align….being in the right place at the right time, in great light, with a killer background, while capturing peak behavioral action, with the right lens, and exposure variables set in camera. Piece of cake. Having the $#%%& camera AF correctly helps, arghh!!!!!!! :: Talk a bit about your metering method for shooting…do you use the camera light meter or a handheld meter? All exposure decisions require the same cognitive reasoning, deciding first what is most important, aperture or shutterspeed? If you cannot get the combination of variables desired alter the ISO. All metering patterns and methods work, some are simply easier to implement than others in certain circumstances. In truth, I will use whatever method I think is easier in a given situation. I believe to truly be a consistent photographer you need to understand the benefits and detriments of each pattern and method. Knowing how the pattern or reference value determines the recommended exposure, be it Eval/Matrix, Spot, Incident, or Reference Values is paramount to this understanding. You need only place one tonal value accurately on a histogram and all others will fall into place. Thereafter, it is a matter of salt and peppering to taste to render the subject as desired, shifting to the right to show more detail in a dark subject, shifting left to render more detail in a white subject. Of course shifting the exposure effects all tonal values in the image, most times at the sacrifice of highlight or shadow detail on either end. Typically, with new cameras having a wider dynamic range the shift need not be as great as with film. What matters most is that a pattern or method affords the photographer a consistent means of determining exposure. My job is to provide students with a firm understanding of the fundamentals so that they can quickly make an informed decision, coming away with the envisioned image, regardless of the lighting circumstance. The ultimate goal is to put creative control back into the hands of the photographer instead of the camera. If a photographer cannot ascertain why an image succeeded or failed he/she has not yet fully grasped the fundamentals. Many aspiring photographers have problems discerning when and how much to add or subtract exposure from the Evaluative/Matrix recommendation. I prefer to eliminate as many variables as I can, choosing not to use Matrix/Evaluative in situations where experience has shown the readings to be erroneous, inconsistent or in doubt. Eval/Matrix works well as long as the subject is not small in size and/or of very different tonal value relative to the background, and in low contrast lighting. I prefer the Spot Pattern as there is never a deviation in the method, no second guessing what built incamera algorithms are doing, subject size to background is irrelevant, etc. The Spot pattern does one thing, it renders whatever is in the pattern as a midtone value, and it does it accurately and consistently. I know exactly what is in the pattern, and how it reacts every time I depress the shutter. Most times I am in Manual Mode. However, I will use Av in conjunction with AEL in fluctuating light…along with the Spot pattern. In sunlight I already know the exposure, sunny f/16 rule, 1/800 @ f/8, ISO 200.. no meter necessary. :: What has digital allowed you to do that was more difficult with film? What has been a downfall (if any) for you from the film days? I jumped on the digital train right away, quickly recognizing the importance of being able to use it as a teaching medium, whereby you could instantly assess exposure, composition, etc, in the field, in real time. Digital has changed the way we photograph. Live histograms and LCD viewing have enabled new photographers to determine correct exposure more quickly than in the past. Of course producing consistently good imagery requires much more than reading a histogram. I think the digital revolution, along with the world wide web, has leveled the playing field. One only has to look on the web galleries (500px.com, 1x.com, etc) to see images produced by many that are, as good, if not better than a working pro on any given day. Humbling, indeed. I got a lot more sleep during the film days, throwing the exposed film in bag at the end of the day. Now I spend countless hours at days end downloading and editing images. Sleep has become a rare commodity. :: What is your favorite piece of NON photographic gear, and why? Without a doubt my mind is my most important piece of nonphoto gear. My infield workflow, proactive methodology, and ability to quickly translate the image I see in my mind to the LCD has proven time and again to be a most valuable asset in capturing those often fleeting decisive moments that can take an image to the next level. Students walk away from workshops with a firm understanding of exposure fundamentals and a new mindset that enables them to consistently produce creative, well exposed, provocative story telling images. :: What was the scariest encounter you can remember from a shoot? Follow that up with a brief commentary on the precautions you take while in the field working with dangerous mammals. 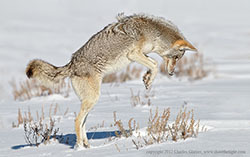 I have had a number of "I care not to repeat encounters" over my wildlife photo career. I have been charged by moose, bluff charged by a bear, hit bull sharks in the face with my camera, and more. But, the one that really freaked me out was when I shooting UW images of a big bull sea lion in the Galapagos Islands. The bull suddenly turned on me, attacking with teeth barred, barking inches from my face. My only protection was to keep him at bay for what seemed like an eternity with my UW housing. Exhausted and exiting the water I was told by our Dive Master/naturalist that there was in fact a very aggressive bull at this location.He told me a gal was bitten in the buttocks while sitting on the edge of a zodiac only two weeks prior. I could have beaten the guy! Lesson learned, I now ask prudent questions concerning wildlife in any area unfamiliar to me. Over the years I have learned a lot about animal behavior. One should always remain situationally aware and alert to an animals behavioral traits that show stress, anxiety, etc. These include lowering and swaying of the head, pinned ears, jaw popping, salivation, fixed eye contact, and more. Things to avoid include running, making loud noise, squeezing an animal into flight or fright behavior, spreading out when in a group, walking directly at a subject, and more. Learning good stalking technique is also prudent if you wish to photograph unaltered behavior. :: What is your favorite animal/location to photograph? What is it about it that continues to draw you back? I get this question often. Bears are without a doubt my favorite subject to photograph. I will have hosted over 60 bear workshops by the end of this year. Individuals among the same species exhibit unique fishing and hunting techniques, and varying degrees of tolerance with each other and humans. Territorial disputes are most often settled with posturing and bluff charges, but things can escalate into a full blown battle for overall dominance, fishing rights, breeding, etc. Clamming, mating, spring cubs..the image possibilities are endless. 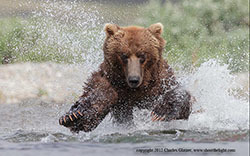 My favorite locations for photographing bears include Minnesota, Alaska, BC, Manitoba, Montana, Minnesota, and Wyoming. :: Which image of yours is the most special (favorite) to you? It can be one that was difficult to take, or where everything just clicked. Talk a bit about what went into making the image. [Editor's note: See the polar bear image to the right of this page.] 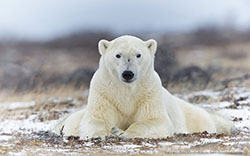 I took this image lying on my belly with the camera at eye level in front of a polar bear on the shore of Hudson Bay. This image has been a dream of mine since I started photographing polar bears quite a few years ago. The bear showed no aggression whatsoever. It was a spiritual moment for me, whereby we both connected for a brief moment looking at each other in amazement and wonder. The vertical taken is amazing, but I am partial to the horizontal with subject symmetry and the inclusion of environment, as this tells more of the story. :: How has the business of photography changed for you over the past decade? How has social media affected the way you work? Are there any of these new trends that you feel could be a cause for concern for the future of photography? With the advent of digital photography so came the arrival of the world wide web, and its dissemination of information. There is no longer a huge disparity in the quality of images produced by amateurs and pros, nor are there any secret locations. With so many now entering the nature photography arena social media is a have to, not a want to. 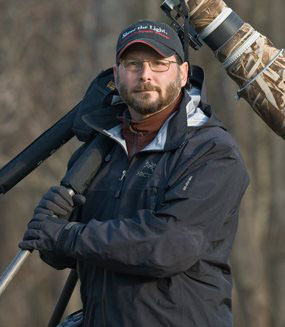 :: How often do you use a flash setup of some sort in your wildlife work? My studio background has taught me to recognize light quality and quantity, and to visualize everything as a lighting ratio. Highlight to shadow, subject to background, everything is about light. Flash is an integral part of my image making process, and I now shoot images in light never before considered. Flash affords the nature photographer unprecedented supplemental illumination control and creativity. By applying different levels of flash illumination we are able control the degree of shadow detail rendered independent of the ambient light. The key lies in illuminating the shadows without obliterating them. If you know how to effectively compress the image brightness range to that of the capture medium, you can capture detail in both highlight and shadow without sacrificing one or the other. Light illuminates, shadow defines. That said, with mammals being my favorite subject I rarely use flash unless striving for a creative effect. The guard hairs on many mammals produce an unnatural sheen with hard flash. Ungulates have severe eye shine if the flash is not placed far off the camera axis, and I find it is not prudent to become the center of attention when photographing large predators. I will often use flash with birds, macro, etc. :: As a wildlife photographer, what role do you feel you need to play in conservation efforts, and in protection of wild areas? How (if at all) does that play a conflict with the growing popularity of wildlife photography and the need for photographers to push boundaries in order to get new and original images? How does one be a good steward of the wilderness while still capturing the beauty…and then avoid the inevitable push from people who see your work to go out and try to do it themselves at a cost to those areas? I have asked "why do I photograph wildlife and what is my purpose" this question of myself, and more recently to a higher power. I received this answer..."Be Among them, Be my Voice". It is my hope that my images act as a vehicle to showcase the beauty of creation, how animals truly enrich our lives, serve to educate, and help preserve habitat. We are not alone. I am often asked in a public forum to divulge the specific location of a subject photographed. My response is always the same...contact me privately! If after talking to the individual I feel the subject will not be endangered I will most likely grant the request. I have seen reeds cut around nesting birds, the alteration of nesting/denning sites to make a better image to the detriment of the subject(s) I find intolerable. As more people compete for notoriety subject welfare gets pushed aside. We must act as stewards to aspiring new talent, no image is worth putting an animals survival at risk. We must do this through our own action, words are not enough. :: With the rise of photography being displayed on the Internet and all the numerous sites for displaying work, how do you keep an eye on your portfolio and protect the images from being stolen, or copied without permission? How often do you find it happening? The copying and unauthorized use of images off the web is a major problem. And, it does happen quite often. Any image posted can be copied, no way around it!! I try my best to put © 2012 Charles Glatzer, www.shootthelight.com "in," not on, the border along with a logo watermark on every image I post on the web. If they hotlink, free advertising. If they remove the copyright and watermark there is no disputing the intent. FYI www.tineye.com is a reverse image search site capable of showing copied images and by whom. :: How did the name, shoot the light, come about? Why the change to a business name over using your already established reputation? How have you tried to incorporate that philosophy into a business model that carries over into personal shooting and educational philosophy? When we decided to incorporate I was thinking about who and what I was in photography. My wife and I kicked around a number of ideas, "Shoot the Light" came to me and I thought it fit perfectly into what I and the business were all about. I run my business one way, treating others with the same respect I would like for myself. Give them everything you can, make them better than yourself. Share your joy in the natural world, and make it fun for all. I never have to look over my shoulder, because I know in my heart I always try to do what is right. :: What is the legacy you want to leave behind after you've stopped heading out to make new images? At what point do you stop the wildlife photography and "retire"... or do you think you'll go out in the field working until the end? More importantly than he was a good photographer, I hope those I have reached through my teachings serve as ambassadors with an even greater purpose helping to preserve wildlife for generations to come. For the past 30 years photography has defined my life, just ask my wife! Retirement? Thought you needed a job first...lol. When I can no longer carry equipment a field I still see myself teaching others. In between fly fishing of course, wink.